Plesiosaurs (Greek: plesios meaning "near" or "close to" and sauros meaning "lizard") were carnivorous, aquatic (mostly marine) reptiles that lived from the Triassic to the Cretaceous periods. They were the largest aquatic animals of their time. The common name "plesiosaur" is variously applied both to the "true" plesiosaurs, belonging to the Suborder Plesiosauroidea, and to the larger taxonomic rank, the Order Plesiosauria. The Order Plesiosauria is divided into two suborders, Plesiosauroidea, made up (mostly) of long-necked forms, and Pliosauroidea, consisting of short-necked, elongated-headed forms. Plesiosaurs that belong to the suborder Pliosauroidea are more properly called "pliosaurs." In this article, the term "plesiosaur" will refer to the order, while "true plesiosaur" and "pliosaur" will be used to designate organisms belonging to the suborders. "True plesiosaurs" (sensu Plesiosauroidea) first appeared at the very start of the Jurassic period, while the Order Plesiosauria appeared earlier, in the Middle Triassic. Plesiosaurs (including pliosaurs) thrived until the K-T extinction, at the end of the Cretaceous period. Plesiosaurs were Mesozoic reptiles that lived at the same time as dinosaurs, and though they are often lumped together with the "terrible lizards," they were not dinosaurs. Although plesiosaurs are not considered to have direct, living descendants, they live today in the human imagination, in books, films, and even as the source of the fabled "Loch Ness Monster." There were many species of plesiosaurs and not all of them were as large as Liopleurodon, Kronosaurus, or Elasmosaurus. When discovered, plesiosaur fossils, were somewhat fancifully said to have resembled "a snake threaded through the shell of a turtle". Major types of plesiosaur are primarily distinguished by head and neck size. The Plesiosauroidea, such as Cryptoclididae, Elasmosauridae, and Plesiosauridae had long necks and may have been bottom-feeders, in shallow waters. The neck of Elasmosaurus was very long, twice the length of the body. The Pliosauridae (pliosaurs) had a short neck with large, elongated head and may have been at home in deeper waters. However, in recent classifications, one short-necked and large-headed Cretaceous group, the Polycotylidae, are included under the Plesiosauroidea, rather than under the traditional Pliosauroidea. The typical plesiosaur had a broad body and a short tail. They retained their ancestral two pairs of limbs, which evolved into large flippers. Plesiosaurs are considered to have evolved from the earlier nothosaurs, which had a more crocodile-like body. All plesiosaurs had four paddle-shaped flipper limbs. This is an unusual arrangement in aquatic animals and it is thought that they were used to propel the animal through the water by a combination of rowing movements and up-and-down movements. They had no tail fin and the tail was most likely used for helping in directional control. This arrangement is in contrast to that of the later mosasaurs and the earlier ichthyosaurs. There may be similarities with the method of swimming used by penguins and turtles, which respectively have two and four flipper-like limbs. As a group, the plesiosaurs were the largest aquatic animals of their time, and even the smallest were about two meters (6.5 feet) long. They grew to be considerably larger than the largest giant crocodiles, and were bigger than their successors, the mosasaurs. However, their predecessors as rulers of the sea, the dolphin-like ichthyosaurs, are known to have reached 23 m in length, and the modern whale shark (18 m), sperm whale (20 m), and especially the blue whale (30 m) have produced considerably larger specimens. The anteriorly placed internal nostrils have palatal grooves to channel water, the flow of which would be maintained by hydrodynamic pressure over the posteriorly placed external nares during locomotion. During its passage through the nasal ducts, the water would have been "tasted" by olfactory epithelia. "True plesiosaurs" appeared to have evolved from earlier, similar forms such as pistosaurs or very early, longer-necked pliosaurs. There are a number of families of true plesiosaurs, which retain the same general appearance and are distinguished by various specific details. These include the Plesiosauridae, unspecialized types which are limited to the Early Jurassic period; Cryptoclididae, (e.g. Cryptoclidus), with a medium-long neck and somewhat stocky build; Elasmosauridae, with very long, inflexible necks and tiny heads; and the Cimoliasauridae, a poorly known group of small Cretaceous forms. Plesiosaurs have been discovered with fossils of belemnites (squid-like animals), and ammonites (giant nautilus-like mollusks) associated with their stomachs. They had powerful jaws, probably strong enough to bite through the hard shells of their prey. The bony fish (Osteichthyes), flourished in the Jurassic, and were likely prey as well. Recent evidence seems to indicate that some plesiosaurs may have, in fact, been bottom feeders. Skeletons of plesiosaurs have also been discovered with gastroliths in their stomachs, though whether to help break down food in a muscular gizzard, or to help with buoyancy has not been established (Everhart 2000). It had once been theorized that smaller plesiosaurs may have crawled up on a beach to lay their eggs, like the modern leatherback turtle, but it is now widely held that plesiosaurs gave birth to live young. Plesiosaur paddle in the Charmouth Heritage Coast Centre. Another curiosity is their four-flippered design. No modern animals have this swimming adaptation, so there is considerable speculation about what kind of stroke they used. The short-necked pliosaurs (e.g. Liopleurodon) may have been fast swimmers. 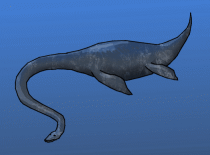 However, unlike their pliosaurian cousins, the long-necked true plesiosaurs (with the exception of the Polycotylidae) were built more for maneuverability than for speed, and were probably relatively slow swimmers. It is likely that they cruised slowly below the surface of the water, using their long flexible neck to move their head into position to snap up unwary fish or cephalopods. Their unique, four-flippered swimming adaptation may have given them exceptional maneuverability, so that they could swiftly rotate their bodies as an aid to catching their prey. The first plesiosaur skeletons were found in England by Mary Anning, in the early 1800s, and were among the first fossil vertebrates to be described by science. Many plesiosaur fossils have since been found, some of them virtually complete, and new discoveries are made frequently. One of the finest specimens was found in 2002 on the coast of Somerset in the United Kingdom by someone fishing from the shore. Another, less complete skeleton was found in 2002, in the cliffs at Filey, Yorkshire, England, by an amateur paleontologist. Many museums all over the world contain plesiosaur specimens. Notable among them is the collection of plesiosaurs in the Natural History Museum of London. Several historically important specimens can be found there, including the partial skeleton from Nottinghamshire reported by Stukely in 1719, which is the earliest written record of any marine reptile. The plesiosaur has a popular place in the human imaginatin. Plesiosaurs are featured in many children's books, fiction (such as Jules Verne's novel, Journey to the Center of the Earth), and films, sometimes serving as a symbol of a lost, child-like sense of wonder. Lake or sea monster sightings are occasionally explained as plesiosaurs. While the survival of a small, unrecorded breeding colony of plesiosaurs for the 65 million years since their apparent extinction is not seriously considered by scientists, the discovery of real and even more ancient living fossils such as the Coelacanth, and of previously unknown but enormous deep-sea animals such as the giant squid, have fueled imaginations. The 1977 discovery of a carcass with flippers and what appeared to be a long neck and head, by the Japanese fishing trawler Zuiyo Maru, off New Zealand, created a plesiosaur craze in Japan. Members of a blue-ribbon panel of eminent marine scientists in Japan reviewed the discovery. Professor Yoshinori Imaizumi, of the Japanese National Science Museum, said, "It's not a fish, whale, or any other mammal." However, the general consensus amongst scientists today is that it was a decayed basking shark. The Loch Ness Monster is reported to resemble a plesiosaur. Arguments against the plesiosaur theory include the fact that the lake is too cold for a cold-blooded animal to survive easily, that air-breathing animals like plesiosaurs would be easily spotted when they surface to breathe, that the lake is too small to support a breeding colony. and that the loch itself formed only 10,000 years ago during the last ice age. The famous "Surgeon's Photo" of the Loch Ness Monster was explained in November 1993, when Christian Spurling confessed on his deathbed that he made it from a toy submarine and putty. The National Museums of Scotland confirmed that vertebrae discovered on the shores of Loch Ness, in 2003, belong to a plesiosaur, although there are some questions about whether the fossils were planted (BBC News, July 16, 2003). It was reported in The Star (Malaysia) on April 8th, 2006, that fishermen discovered bones resembling that of a Plesiosaur near Sabah, Malaysia. The creature was speculated to have died only a month before. A team of researchers from University of Malaysia Sabah investigated the specimen but the bones were later determined to be those of a whale. ↑ BBC News. Plesiosaur bottom feeding shown. Retrieved May 24, 2007. ↑ New Scientist. Why the Loch Ness Monster is no Plesiosaur. Retrieved May 24, 2007. ↑ Kuban, Glen J. Sea-monster or Shark? Retrieved May 24, 2007. Carpenter, K. 1996. A review of short-necked plesiosaurs from the Cretaceous of the western interior, North America. Neues Jahrbuch fuer Geologie und Palaeontologie Abhandlungen (Stuttgart) 201(2): 259-287. Carpenter, K. 1997. Comparative cranial anatomy of two North American Cretaceous plesiosaurs. In J. M. Calloway, and E. L. Nicholls, eds., Ancient Marine Reptiles. San Diego: Academic Press. Pg. 91-216. Carpenter, K. 1999. Revision of North American elasmosaurs from the Cretaceous of the western interior. Paludicola 2(2): 148-173. Cicimurri, D., and M. Everhart. 2001. An elasmosaur with stomach contents and gastroliths from the Pierre Shale (late Cretaceous) of Kansas. Trans. Kansas. Acad. Sci. 104: 129-143. Ellis, R. 2003. Sea Dragons. Kansas University Press. Everhart, M. J., 2000. Gastroliths associated with plesiosaur remains in the Sharon Springs Member of the Pierre Shale (Late Cretaceous), western Kansas. Kansas Acad. Sci. Trans. 103(1-2):58-69. Everhart, M. J. 2002. Where the elasmosaurs roam. Prehistoric Times 53: 24-27. Everhart, M. J. 2005. Gastroliths associated with plesiosaur remains in the Sharon Springs Member (Late Cretaceous) of the Pierre Shale, Western Kansas" Kansas Acad. Sci. Trans. 103(1-2): 58-69. Hampe, O. 1992. Ein groBwuchsiger Pliosauride (Reptilia: Plesiosauria) aus der Unterkreide (oberes Aptium) von Kolumbien. Courier Forsch.-Inst. Senckenberg 145: 1-32. O'Keefe, F. R. 2001. A cladistic analysis and taxonomic revision of the Plesiosauria (Reptilia: Sauropterygia). Acta Zoologica Fennica 213: 1-63. Storrs, G. W. 1999. An examination of Plesiosauria (Diapsida: Sauropterygia) from the Niobrara Chalk (Upper Cretaceous) of central North America. University of Kansas Paleontologcial Contributions (N.S. ), No. 11. Welles, S. P. 1943. Elasmosaurid plesiosaurs with a description of the new material from California and Colorado. University of California Memoirs 13:125-254. Welles, S. P. 1952. A review of the North American Cretaceous elasmosaurs. University of California Publications in Geological Science 29:46-144. Welles, S. P. 1962. A new species of elasmosaur from the Aptian of Columbia and a review of the Cretaceous plesiosaurs. University of California Publications in Geological Science 46. Williston, S. W. 1890. A new plesiosaur from the Niobrara Cretaceous of Kansas. Kansas Academy of Science Transactions 12:174-178. Williston, S. W. 1902. Restoration of Dolichorhynchops osborni, a new Cretaceous plesiosaur. Kansas University Science Bulletin 1(9):241-244. Williston, S. W. 1903. North American plesiosaurs. Field Columbian Museum, Publication 73, Geology Series 2(1): 1-79. Williston, S. W. 1906. North American plesiosaurs: Elasmosaurus, Cimoliasaurus, and Polycotylus. American Journal of Science, Series 4, 21(123): 221-234. This page was last modified on 29 August 2008, at 15:15.